Being a homeowner is all about keeping up with regular maintenance. From outdoor chores like yard work and cleaning out the garage to indoor chores like changing light bulbs and checking batteries in smoke alarms annually, a homeowner’s work is never done! What you may not know is that aside from those there are other maintenance tasks you should be doing. Major home appliances such as your HVAC unit can also benefit from regular service. A central air conditioner is one of those “out of sight, out of mind” appliances that you tend to not think about, until it stops working! But keeping up with maintenance on your A/C unit can greatly extend its service life, and also save you some money! A qualified A/C technician will perform several checks on a unit, whether it is mounted on the rooftop or on the ground near your house. They will check the level of refrigerant in the system – a small leak can cause additional strain on the system, causing it to run more frequently. They will also check the amperage draw of the motor to ensure it is within specification. A motor that is worn out will be operating at a higher than normal temperature, which will increase the likelihood of motor failure. Similar to the air conditioning system on a car, a home A/C unit also has a compressor and a fan to draw air past a coil. These items are belt-driven, and belts should be inspected for cracks or wear, especially in climates with hot, dry summers such as Sacramento. 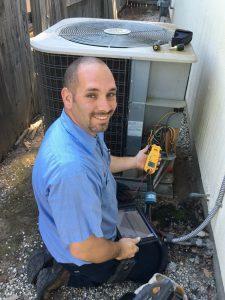 A thorough inspection of your home’s air conditioning unit will also include cleaning and examining the condenser coil and all electrical connections. Even in dry environments, moisture can build up on electrical connectors and other areas that are not properly weatherproofed. Corrosion on the cables can lead to problems down the road. Inside the home, the HVAC technician will check the condition of the filter, and also perform a temperature split check. This is done by inserting a temperature probe into the return air duct, and another one into the supply air duct. By comparing the difference in temperature (delta T) between the incoming and outgoing air, the technician can determine if the system is operating efficiently or not. The cost of an annual A/C tuneup is nominal compared to the cost of replacing an entire unit that failed due to a preventable problem. By having an expert HVAC technician inspect your home air conditioner, you can rest easier knowing that your future repair costs will be lower, the equipment life will be extended, and your utility costs will be lower. The experts at Bonney have been providing quality home service repairs to the Sacramento and Rancho Cordova area for almost three decades. Contact us online or call 800-444-0551 to schedule a Spring Air Conditioner Tune up for your home!